The last year has been pivotal for Social Business as organisations shift from being concerned about the issues that the new Social, Mobile, Analytics & Cloud (SMAC) technologies raise for their IT strategy, to accepting that they are irreversible and adapting strategies to accommodate them. The question is now when and how each organisation should embrace them. There is an emerging acceptance that sharing knowledge across organisations will increase their ability to deliver more effectively on their business priorities – and that better tools than email are needed to raise users’ productivity and leverage the organisation’s talent effectively. Have you noticed that job roles with Knowledge Management in their title have suddenly started changing to say something like Social Media? The question now is which tools and platforms best address this need and how to introduce them. Companies that would have said, only a couple of years ago, that their strategy for mobile was Blackberry, and that it wasn’t going to change any time soon (well, apart from some senior executives that were allowed to connect their iPads to the network – in an echo of the way Blackberry penetrated enterprises by winning the hearts and minds of senior managers), are now making bold statements that “Bring Your Own device is our strategy.” It’s just a question of when and how. Similarly, Big Data and Cloud have become acceptable technology choices and organisations are working on their IT strategies to figure out how they fit and where to prioritise them. Social Business is rapidly moving from the latest fashion fad to business as usual. But does that work? Can organisations successfully adopt collaborative ways of working without changing their command and control hierarchies, and their competitive organisational structures and employee compensation schemes? Can the commoditisation of the users access point and shift to user selected and managed devices be reconciled with traditional “locked down” IT management? How will employees and customers privacy concerns be addressed when using analytics to derive information from every fragment of content they produce and every conversation they have? How will we change traditional views of enterprise security management and confidentiality regimes when, not only is the data being stored in some Cloud service somewhere, but we are pointing powerful analytics at it specifically to find new insights while providing transparent access, as far as possible, to all employees from the privately owned devices in their pocket, so they can use it to increase company profits? Or is it true that social business technologies are disruptive, and therefore will disrupt current enterprise structures, processes and policies as they are adopted. Is this an inevitable part of becoming a Social Business? It makes the point that social business is primarily a cultural change, with significant organisational and operational implications, but one that can only be made if it is supported by the right technology. It’s a bit like the cultural shift from the Internet being something you used when sitting at a desk in front of a PC, to something use while walking down the street. It took the right package technology (initially the iPhone and App Store, then it’s smartphone siblings and their ecosystems) to enable that shift to “suddenly happen” – even though the 3G networks and devices with similar capabilities (for example Nokia’s Communicator range) had been around for a while without catalysing the change. As a sweeping generalisation, I see companies that use a proper, integrated Social Business platform from the leading vendors are generating successful adoption of the cultural and process changes they are looking for, while those that think that can make this transformation with tools they already have, or legacy technologies that just offer document sharing and communications, are failing. Proper social platforms are built from the bottom up to facilitate effective collaborative working, have deep embedded social analytics to surface the information users want and can integrate with existing business applications through open standards to add value to existing processes. They are not, primarily, a content platform (indeed they should be able to integrate with and use the content platforms an organisation already has in place), rather they are a platform for building relationships between employees (and between employees and partners or customers), and for discovering experts and knowledge (whether that knowledge is in a document internally, or externally, or exists only in someone’s head). They are people centric, not document centric, collaboration platforms. In 2013 we also saw the start of change in the market. Social business discussions had previously been focussed in two areas: Marketing, to engage externally via social media, and IT, as a better collaborative infrastructure than email. Now there are enough proof points of the value of social business techniques to get attention from all parts of the business: from the sales force to customer support, from HR to financial planning, from procurement to catering. So Social Business technology vendors will tell you that 2013 saw the rise of Line of Business (LoB) as the key influencer in purchases, rather than IT. Sometimes signing the cheques (especially for cloud based services) and sometimes driving IT’s procurement priorities. This has implications for how technologies are acquired, since LoB are project based whereas IT are focussed on infrastructures for use across the organisation. Projects often are not large or important enough to justify the purchase of an entire enterprise infrastructure, and that has led to a recurring theme in discussions with IT as they discover that the company is all ready running 4, or 5, or 10, different social business platforms for different projects (some in cooperation with IT, some independent but with acquiescence of IT, and quite a few without the knowledge of IT). Not only is this causing increased financial costs, but it also creating silos of knowledge and reinforcing exactly the sorts of barriers within the organisation that social collaboration is trying to remove. This trend is also driving one of the characteristics of the age of Social IT. Big, enterprise wide, mega-projects, fully costed (and with all the risks taken out) are no longer seen as the way to succeed. Rather the right approach is to start many, small projects and evolve them, accepting the innovation risk of failure and investing in and developing the projects that prove they can deliver real value to the business. The mantra is that of continuous proces improvement, not wholesale process reengineering. This is leading to organisations starting to put a strategy in place of acquiring an enterprise infrastructure which can start small and grow, hosting the evolution of divergent existing social projects, and being used as the platform for new ones. It is starting to require organisations to rethink their security policies and integration architectures to allow projects run on external cloud platforms, so as to avoid large, up-front investments (even if they could afford them – simply creating a large project drives behaviours and metrics which are ill-suited to the sort of agile, collaborative organisations that innovate successfully and outpace their competition). Integration is key here. Not just with existing content and applications, but also across different solution domains. For example, it is increasingly becoming clear that the separation of marketing’s social media activities from internal social collaboration platforms has negative consequences. Organisations are realising that they cannot get benefits from their social listening if they cannot effectively communicate the insights it generates to the employees who need to understand them (and act on them). This requires internal collaboration with the employees that can take advantage of the insight to improve the company’s products, services and processes – and who knows where in the organisation they might sit? And anyway, enterprises are starting to realise that external social engagement isn’t just something just a skilled social media team do. More and more of their employees are present on social media already and they understand that they can use interactions through social networks with their customers, partners and suppliers to do their jobs better and deliver better business results. Gartner calls Social, Mobile, Analytics and Cloud a “nexus of forces,” which encapsulates the idea of synergy between them – the sum is greater than the whole. But look back previous waves of related technologies – like the Internet, the World Wide Web, email and laptops, that enabled nomadic workers, new corporate structures and globalisation. That wave of change was also synergistic with wider trends (e.g. affordable mass air transportation, 24 hour satellite news and the dominance of free market capitalism) to drive significant business changes – and with them broader cultural changes. All of which set the stage for what came next: social media, always on mobile employees, vast quantities of unstructured data and utility computing available at low cost in the cloud. Today’s vision of social business won’t be frozen in time and gradually adopted by all organisations – it will continue to evolve as each organisation adopts it, as each vendor evolves their offerings, as each entrepreneur brings a new idea to the market, and as each individual user provides feedback on what they are using, to contribute collectively to innovation in the space. The rate of change shows no sign of slowing down. In the early 1990’s I worked for a company (Soft-Switch) that had great success connecting corporations’ separate, siloed email systems together. By the end of the 90’s that business didn’t exist. Not only did most organisations run only one enterprise email platform, but SMTP integrated the remaining systems seamlessly with each other and with applications. Social Business platforms are still at the maturity level of those early 90’s email systems. They have a lot of evolving to do. There will be a lot of consolidation I the market. So businesses need to invest at the enterprise level with a social platform that will survive (and IBM is clearly the market leader). I asked above whether Social Business will disrupt current enterprise structures, processes and policies? I think it is starting to do this already in some companies (like IBM). The interesting question is whether it will deliver on its promise and give those companies enough of a competitve edge that the rest will have no choice but to follow their lead. This entry was posted in business, social, social-business and tagged 2013, business, collaboration, social, social-business, Strategy. Bookmark the permalink. Stuart, I absolutely with your sentiment. Social technologies have undoubtedly changed the landscape as far as consumer behaviour is concerned and this HAS to have an impact on how companies align to face this change. I think you are right in that there has been a somewhat preoccupation with the technologies (SMAC) etc, I also agree that companies are beginning to realise that the scope of Social Business reaches beyond Marketing and into the soul of the business. For many Social Business is still seen as something ‘new’ but will rapidly become accepted as the norm, and in many ways is reminiscent of the times when companies had to be convinced of the need for a company website. It often takes time for new ideas to gain traction and we have in addition to manage and help overcome peoples natural resistance to change. 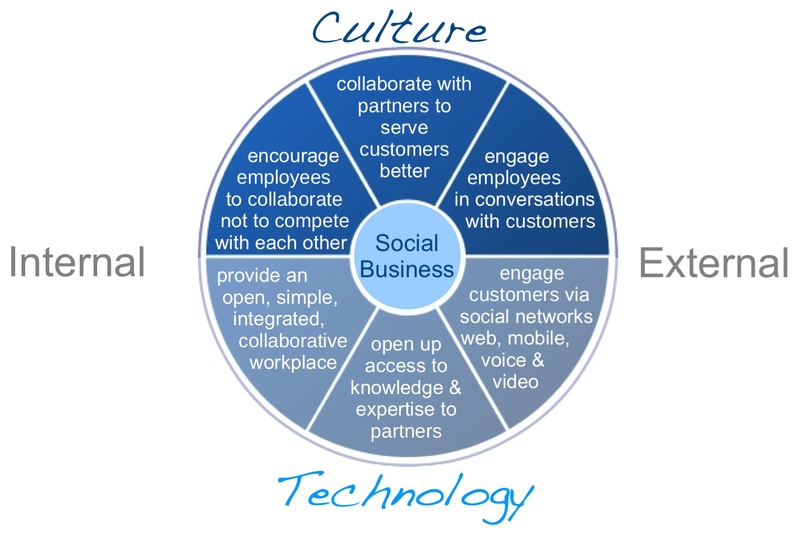 Social Business adoption has many challenges perhaps the most significant being that it requires deep cultural rethinking throughout the business. This is potentially its’ Achilles heel, in that if it was something that only affected a small part of the business; it would be a lot easier! Put simply Social HAS transformed the consumer; and companies will have to respond and make changes to the way in which they engage (not just with the consumer/customer – but throughout the Enterprise, internally and externally, and up and down the value chain) or they will quickly appear to be speaking a ‘different language’ and be unable to do business. To be effective, and successful the Enterprise itself HAS to become ‘socialised’, and this is perhaps the biggest barrier to overcome. Many company structures with their hierarchies and siloes are completely inappropriate to the new engagement model required, and to many millenials entering the workplace they resemble something out of the dark ages, which to a large extent they are having remained unchanged since the Industrial Revolution. The changes within IBM are probably as much the reason that IBM is a market leader as any other. Not only do they advocate change, they are able to demonstrate they have/are doing it themselves and can case reference the benefits. Thanks for the kind words and for sharing your thoughts Mike. It’s going to be an interesting journey. If you get a moment to look, I just posted a (much shorter!) viewpoint on the trends I see for 2014. I’d be interested in your feedback.